'Persisting with the inequalities, indeed seeing them get worse, is no one's prescription for national unity,' notes T N Ninan. Globally, we are living through the Great Convergence, when many of the poorer nations have been growing their incomes faster than the wealthier ones, thereby closing some of the gap between the two groups. What about convergence within the country, between the poorer and richer states? The hard truth is that there is none. Instead, there is only divergence. Madhya Pradesh has half the tax resources of Karnataka (not counting transfers from the Centre), with a population that is 20% bigger. UP has two-and-a-half times the population of Tamil Nadu, but broadly similar tax resources. The bottom rung is occupied by (you guessed it) Bihar, which, with a substantially greater population than Andhra Pradesh and Telangana combined, has only 12% (yes, twelve per cent) of the Telugu-speaking states's tax resources. Odisha has half the tax resources of Kerala, but a 30% greater population. Central transfers can make up some, not all, of the inequality. MP gets two-thirds more central money than Karnataka, and Bihar 50% more than the Telugu-speaking states. But per capita social sector spending by the poorer states remains lower than in the better-off ones. This is the opposite of what it should be, if the backward states are to catch up with the others. Bihar spends Rs 76 per head in a year on the social sector, while Kerala spends Rs 139. UP spends Rs 69 while Maharashtra spends Rs 120. West Bengal spends Rs 95 while Karnataka spends Rs 124. Some relatively backward states do better, like Chhattisgarh (Rs 150) and Odisha (Rs 115), but in general the pattern is skewed towards the south and west -- the states that already have higher levels of attainment. These inequalities reflect even greater inequalities in private sector investment across states, the relative shares of airline flights, the availability of quality jobs, and so on. Migration provides only a partial corrective. 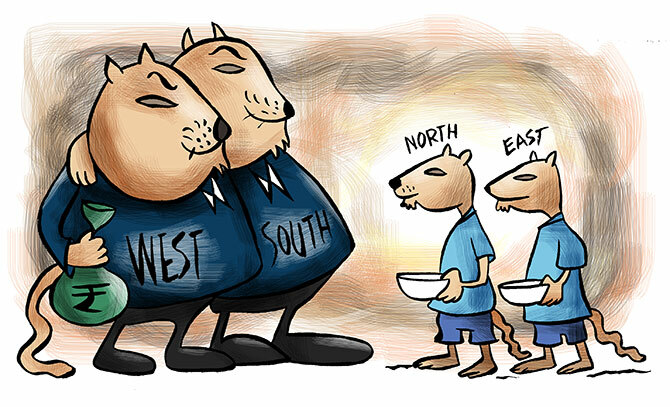 Inevitably, the skew in central transfers to the poorer states of the east and north is financed from the tax resources contributed by the southern and western states. So far this has passed unnoticed. But voices of protest were heard last year when it became known that the Finance Commission (which decides on central transfers to states) may have been asked to increase transfers to the poorer states, at the cost of the states from where the bulk of the revenues come. Indeed, the introduction of the goods and services tax in 2017 had been expected to shift state GST money to the 'consuming' states from the 'producing' ones. This was one of the reasons why Narendra Damodardas Modi as Gujarat chief minister had blocked the introduction of the GST, because he feared loss of state revenue. To everyone's surprise, it does not seem to have worked out that way, but may well do so over time. Meanwhile, the tinderbox issue is state-wise Lok Sabha seat allocation. This has remained frozen for nearly half a century, even as the population in the Bimaru states of the east and north has grown, relative to the south. The result today is that the average Lok Sabha constituency in Bihar has 2.6 million citizens, but only 1.65 million in Kerala; and 2.5 million in Madhya Pradesh compared to 1.84 million in Tamil Nadu. The next review of the state-wise seat allocation is due in 2026. Should a decision be taken then, that the citizen-per-seat ratio be equalised, you can expect strong protests from the south. And yet, keeping the present seat allocation frozen indefinitely would mean steadily more unequal representation across states, given that the southern states are no longer producing enough babies to sustain their population over time. What should be clear is that the two issues -- equalisation of state finances and of Lok Sabha representation -- cannot be addressed simultaneously, lest a spark be lit and start a fire. Yet persisting with the inequalities, indeed seeing them get worse, is no one's prescription for national unity. Will fudging the issues be a solution? Only for a while, but it will buy time. Should Centre share tax collection pie with states?